Do headline writers actually read the first word of an article? Do editors just post anything given to them? If you need proof of that, look at this piece of garbage written by a sports writer last year. 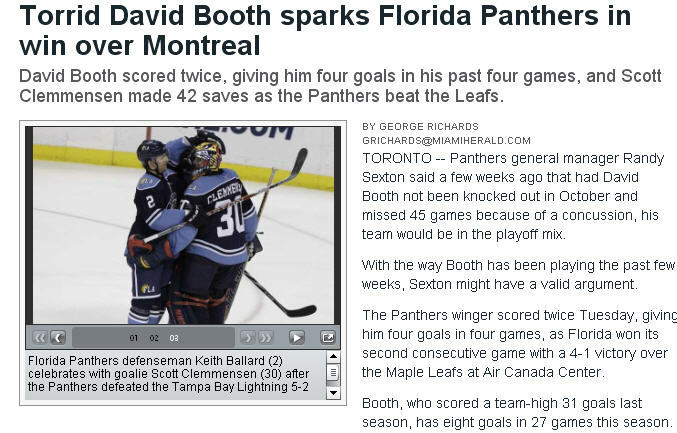 Florida is winning meaningless games to close out the 2009-10 NHL season. How nice of them. Forward Rostislav Olesz scored his first point since the Harding administration in 22 games too. How nice of him to show up. Boston beat Atlanta last night. That gives the Bruins a 3-point hold on the last playoff spot. Don’t punch their ticket yet. Boston has two games left with Washington. Even should they make the playoffs, Boston, Atlanta, or whoever will get steamrolled by the Caps. The only Eastern Conference teams up to beating Washington are New Jersey, Pittsburgh, or Buffalo. Are the 2007-08 Florida Panthers over the hump?